Kindergarten & Preschool for Parents & Teachers: Video of me reading "The Gingerbread Baby"
Video of me reading "The Gingerbread Baby"
Merry Christmas! 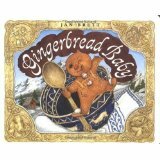 Take a break, gather the children around, and let me read to you Jan Brett's book The Gingerbread Baby. A friend emailed me that Sarah looks "mildly tortured." It had been a long day but she wanted to be in the video and thought I wanted her to smile the whole time. On previous attempts the book had too much of a glare, according to my husband. Okay, we're amateurs. Here is a professionally produced music/video guaranteed to put you in the Christmas spirit: Andrea Bocelli and Mary J. Bling sing "What Child is This?" For a glimpse into Kindergarten see my book. Would you like inexpensive ideas, activities, and games to teach your child through play? Mommy with Selective Memory and I can help save your sanity, one project at a time, with The Happy Mommy Handbook: The Ultimate How-to Guide on Keeping Your Toddlers and Preschoolers Busy, Out of Trouble and Motivated to Learn. Both have been number 1 bestsellers on Amazon and make wonderful gifts for parents and teachers. My friend emailed me that Sarah looks "mildly tortured." Sarah thought she was supposed to smile the whole time. My husband didn't like the glare on the book the previous times we tried it - so we left it at that. Kinda funny but our first video attempt. So glad you liked it and thanks for stopping by. I like your site too. Love the blog hopping. I'll try this after nap when it's wake up time before snack. Mildly tortured :) THat's funny! Thanks so much for joining Flock Together last week at Mom’s Best Nest . I am now your happy follower and look forward to reading your posts. Mikki - you are my 100th follower! Bless you and Thank you! Merry Christmas! Feel free to pin my original post or if using parts, link back to my original. Photos are mine, purchased, or used with permission. Author of bestselling books "Kindergarten: Tattle-Tales, Tools, Tactics, Triumphs & Tasty Treats for Teachers & Parents" and "The Happy Mommy Handbook." This blog is about how children learn thru playful activities, school readiness, parenting, early childhood development, and reading & writing skills. MS Family & Child Development. Taught Sp. Ed,, Kinder & Preschool. ADHD, Autistic or Sensory Processing Disorder? Kindergarten Readiness - Enroll or Wait? Copyright 2012 by Susan Case. Picture Window theme. Powered by Blogger.